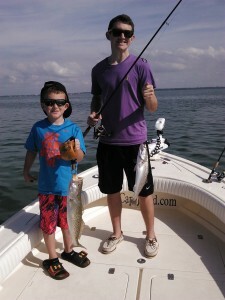 Aprils Fishing has been fantastic both in the Clearwater beach area, and as well as inside of Tampa Bay. 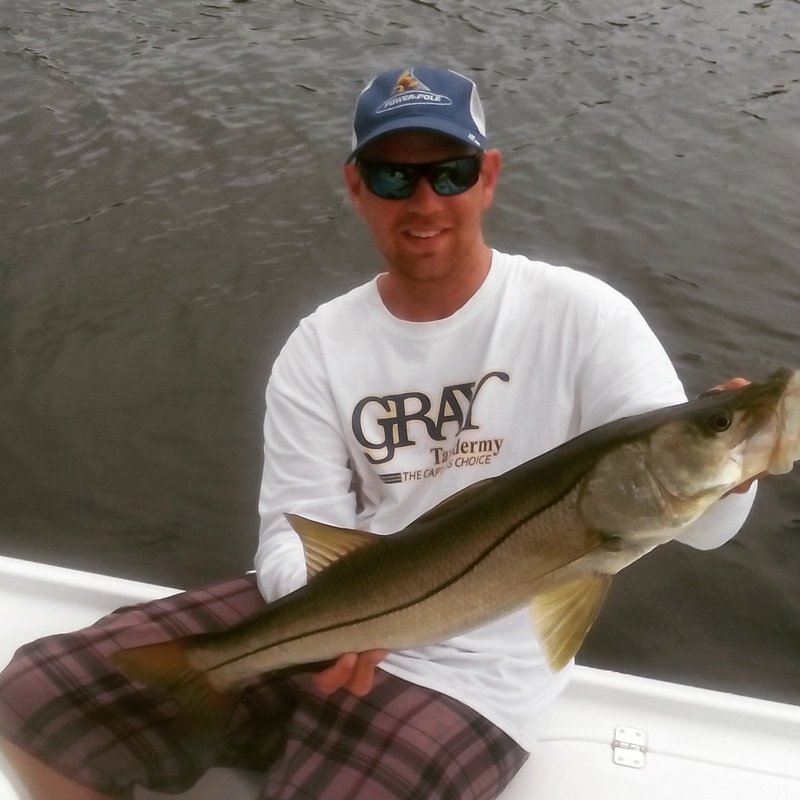 Snook fishing has been phenomenal both in the bay and along the gulf beaches. Redfish have been patrolling the shallow grass flats and mangroves edges, and near shore the mackerel and Kingfish have been very consistent throughout all of Pinellas county. Snook have been the main target on most of my charters for the last month or so, and some days we have been catching close to 100 Snook with a few anglers fishing 4-6 hour periods. Live sardines have been the key to having banner days. Some days bait has been easy and other days it has taken me upwards of 2+ hours to obtain enough bait for the day. Free-lined and corked baits have both been producing well combined with a 30lb. leader and 1/0 circle hook. Look for the Snook to feed well on both the incoming and outgoing tides. Most of the Snook have been in the mid 20” range, but slot fish have been caught on pretty much every trip along with several over slot fish. Snook fishing should remain outstanding for the next couple of months! Redfish have been around for the anglers looking to target them. Look for the Redfish to be around the deeper mangrove shorelines on the high tides, and out in the deeper pot holes on the lower part of the tides. Most the the reds have been upper slot to over slot fish ranging anywhere from 25-35”. Live sardines either free-lined or fished under a cork have been producing well, but cut pinfish, ladyfish, and threadfins are also getting plenty of bites. 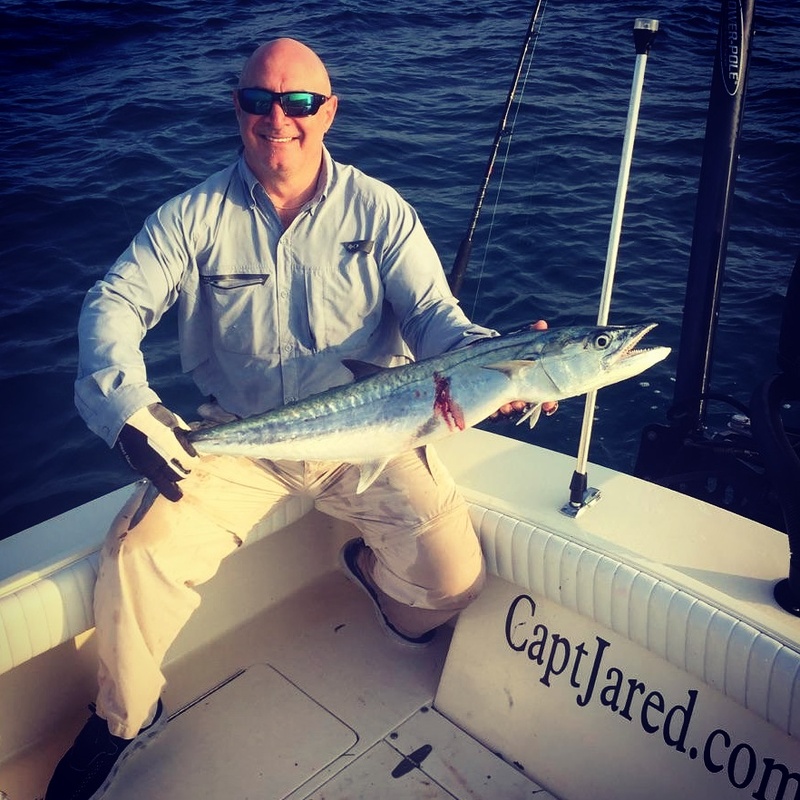 Near shore along the beaches of Pinellas county Spanish mackerel and Kingfish have been consistent catches for many anglers. Slow trolling live baits around the pubic reefs has and hard bottom areas put plenty of fish in the boat. The mackerel have been good size and the kings have been between 10-20lbs on average. Live threadfins, sardines, blue runners and any other baits sabakied near the reefs have been working. Kings should remain in are area for at least a few more weeks. 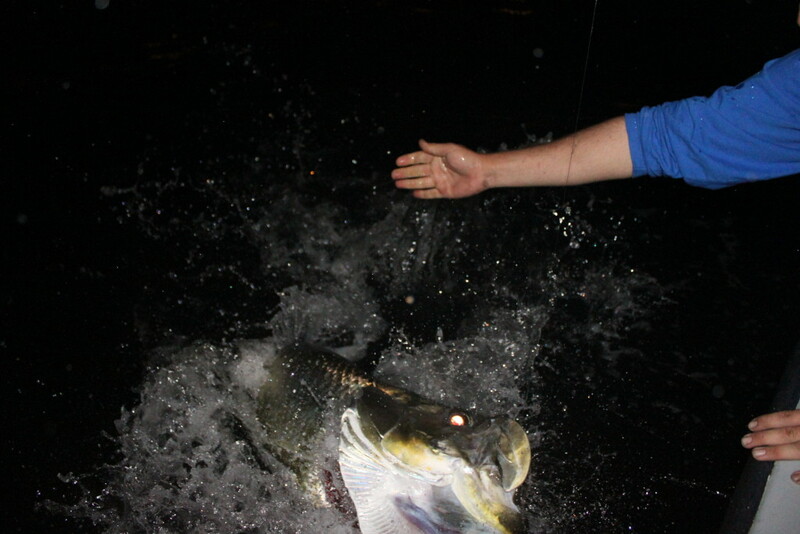 Tarpon season has also started with fish showing up in many places throughout the Tampa bay area. We have been mainly been fishing the early part of the morning or around sunset as the fish have been more active. Tarpon fishing will only get better as we get closer to May and June when the fish really start show up in big numbers, but they are available for the anglers looking to do battle with the silver king! 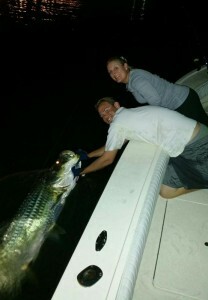 If you want to book a Tarpon charter it is better to call sooner than later, as often the best days go quick. Spring is here and weather has been excellent! The Fishing has also been outstanding! Bait has showed up in both the gulf and the bay, and has been easy to obtain making for some awesome trips! Inshore the Snook and Redfish have been feeding heavily, and near shore the Mackerel and Kingfish have also showed up. Tarpon have also started making appearance in a few areas throughout the bay. 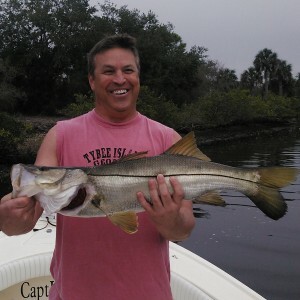 Snook fishing has been getting good over the past week or so for the anglers that have “white bait”. 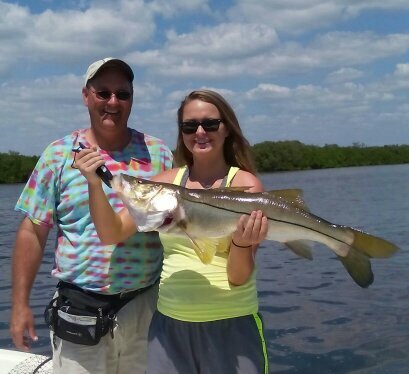 Snook are pushing out of the back country areas and making their way towards the beaches. 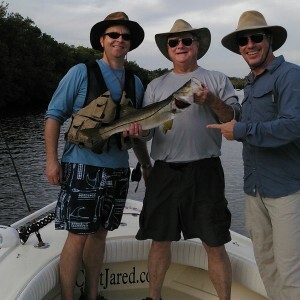 Look for the Snook to be on points and areas in between the back country and the beaches. Free lining “white baits” in these areas are producing some quality fish. 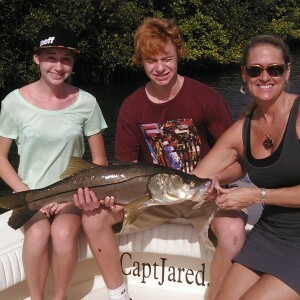 Snook season is now open, and there has been quite a few slot size fish being caught, along with a few over slots and plenty of under slot fish. 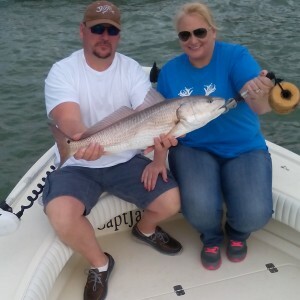 Red fishing has been outstanding lately with some nice over-slot fish being caught. Fishing around the higher parts of the tides has been more productive as the fish are hanging tight to the bushes. As the tides turn as start going the fishing creek mouths and pockets have been turning on. Live bait, cut bait, and shrimp have all been producing great results. Free-lined baits or baits fished under a cork have both been working equally as well. Fishing with artificial lures will also be productive, spoons and soft plastic paddle tail jigs have both been working well. Near shore mackerel and kingfish have both showed up in good numbers over the past two weeks as the water temps have risen dramatically. Fishing around some of the public reefs have produced good results for many anglers lately. Anchoring and chumming or slow trolling have been both been productive methods to target these mackerel. Live sardines, herring, and blue runners have all been working, and getting bait should be no problem when fishing around these reefs, and if no bait is present move to areas where it is. Tarpon fishing is also starting to heat up for the anglers willing to spend the time fishing for them. There is fish moving all around the bay and even a few starting to be spotted along the beaches. It wont be long till there are here in full force, but for the anglers looking to hook into the Silver Kings the possibilities are there! Spring Fishing has begun! Bait is finally starting to show up on some flats, and the fishing has been heating up rapidly, just like the weather. 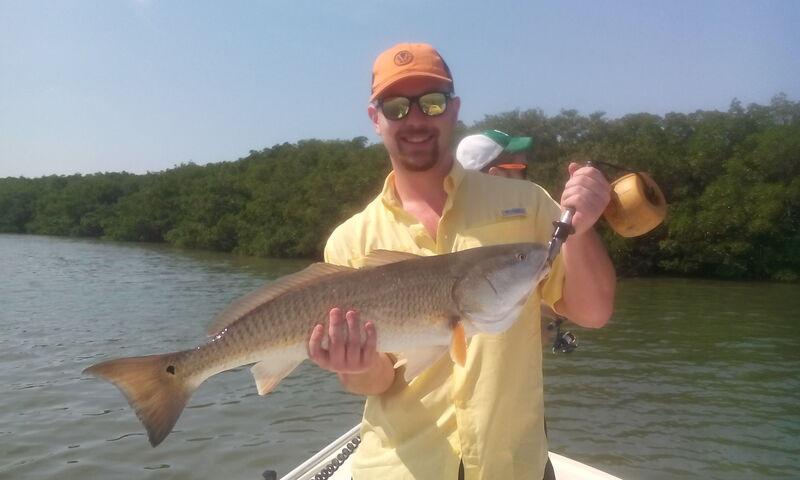 The first week of March the Redfish bite in both Tampa Bay and Clearwater has really been consistent with plenty of fat slot and over slot fish just as predicted. 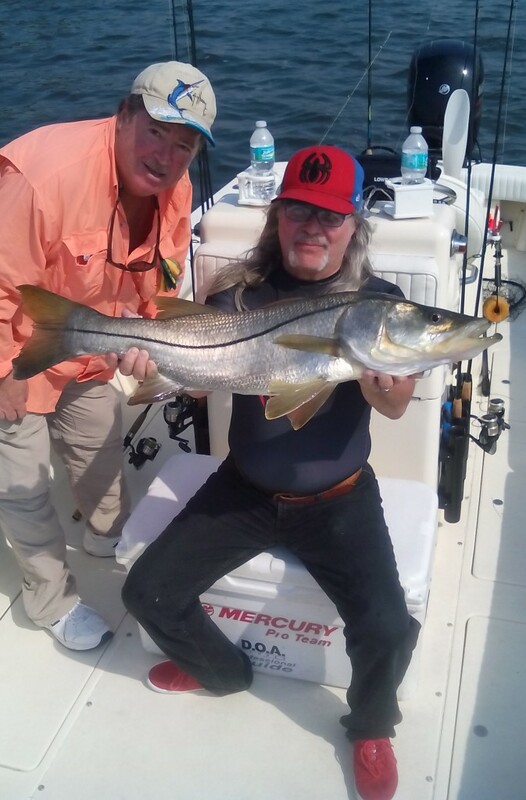 Snook fishing has also been improving on a daily basis, and it won’t be long till the silver kings and silver bullets will be showing up in our area. Redfish has been the main targets with the great tides we have been having over the past week. There has been plenty of schools of fish just about on every flat in Pinellas county. 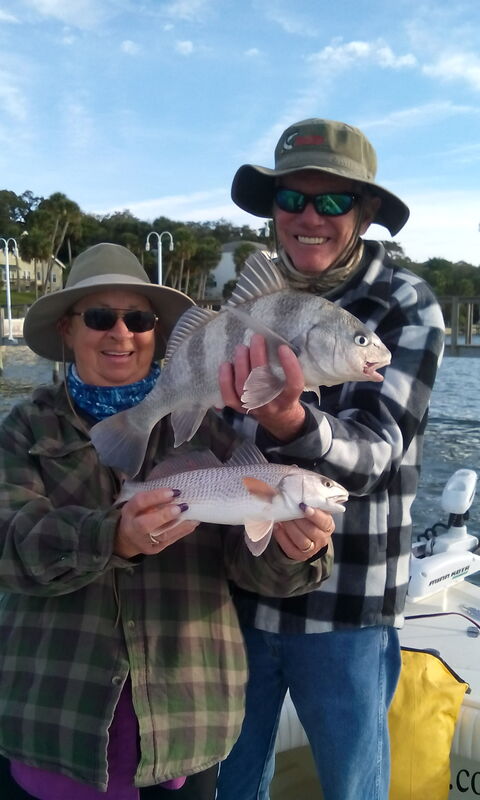 Once the fish have been located live shrimp or cut or live pinfish fished under a cork have been producing good results as the fish have been quite hungry lately. On recent charters we have caught fish of all sizes ranging anywhere from 16” to 36”. The key to finding these schools of fish is to locate the mullet and the Redfish shouldn’t be far behind. I expect the Redfish action to remain consistent for quite some time. Artificial spoons and soft plastic scented jigs will also get the job done for those anglers that don’t want to use live bait. 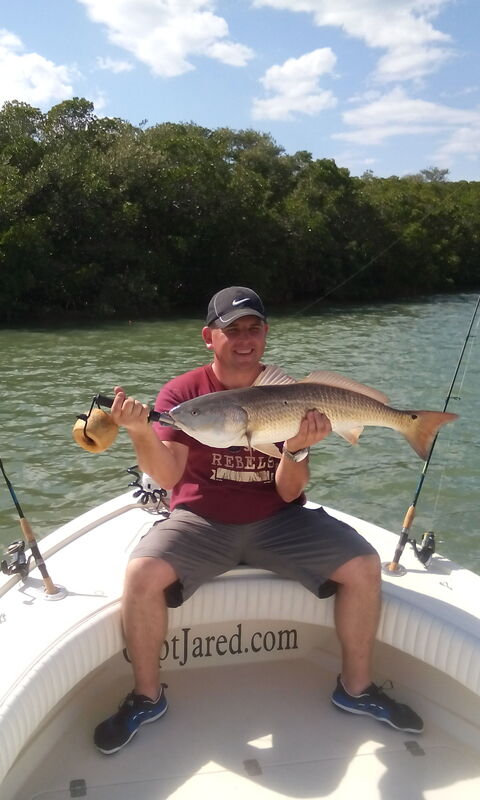 Mark with a over slot redfish he caught while on a fishing charter in Clearwater, FL. Snook fishing has been improving with each passing day as the water has been slowing warming up, and the bait fish are starting to show back up. On a recent trip we caught multiple slot fish, along with a bunch of other quality Snook. I will start Snook fishing some more in the next few weeks as the fish prepare to leave the canals,creeks, and back county areas they have been holding in for the past couple of months. Live bait will be the key to enticing these fish to feed. Free-lined white bait’s did the trick on my last couple Snook trips. 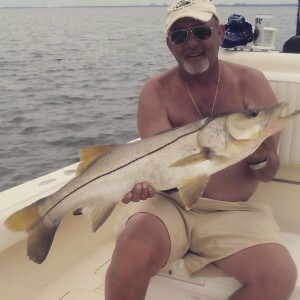 Snook fishing charter in clearwater, FL. Trout have still been around, but the bite has been slowly get worst each trip as the water warms up and the fish are on the move. Shrimp and jigs fished along the bottom have still been producing limits of trout, but we have been having to work a little bit harder than in the past weeks. Drift fishing has been the most productive way to locate the fish as they have been spread out and not schooled up. 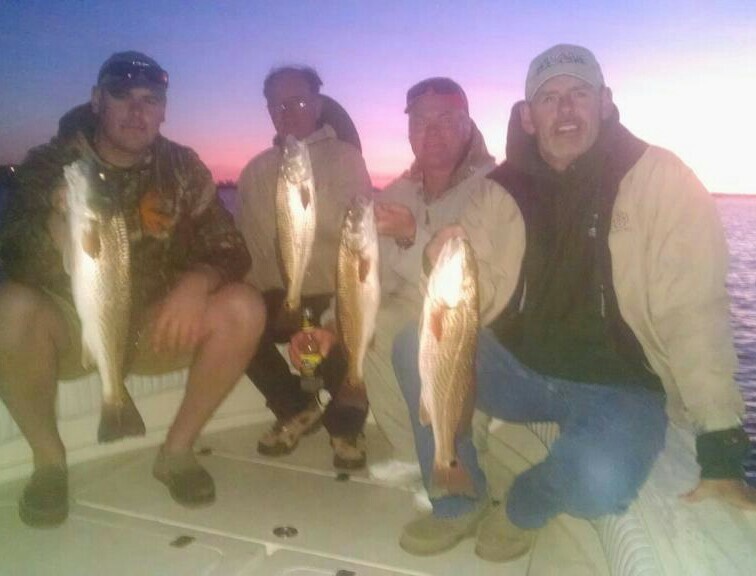 Limit of trout and redfish from a dunedin fishing charter! The water has been warming up rapidly, and the fishing is about to really get good. In the next few weeks the bait should show up along the beaches and pass, and the game fish we been right behind. Tarpon and Kingfish should be just around the corner and once the water hits the 70’s and stays their. The fishing will be excellent for almost any and all inshore and near shore species in the next couple months. Tampa Bay Fishing Report – End of Feb. Fishing over the past week in Tampa Bay has been tough with the coldest cold fronts of the year. Fishing has been tough due to the fact that it is 70 degrees one day and 50 degrees the next, coupled with strong winds it hasn’t been easy. Trout, Redfish, Sheepshead, and Black drum have still been the main targets as they are the most susceptible to the cold conditions. Trout fishing has still been fairly consistent as long as the tide is moving and the seas are calm. Live shrimp fished on the bottom has been working slightly better than fishing with a float, as the fish have been holding closer to the bottom with the conditions. Jigs fished slowww have still been producing good result. The key when fishing with jigs over the past week has been not only work it slow, but being able to feel the strike as they haven’t as aggressive. Reeling when the fish bites has worked better than setting the hook as they have been short striking. Jake with a nice trout while on a fishing charter in Clearwater, Fl. 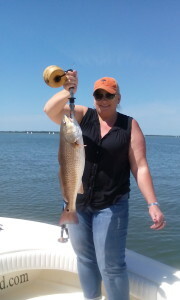 Redfish have picked up with the passing of the new moon and more fish are showing up. A lot of the fish have been quality mid slot to upper slot fish, but they haven’t been willing to eat, but there are always a few that will! The small “Rat” size redfish have still been abundant and are more than willing to eat. Docks, Oyster bars, and mullet schools have all been holding fish, and once you find a few you are able to build a pattern fairly quickly. Tony and Pam were visiting Clearwater Beach and decided to do some fishing! 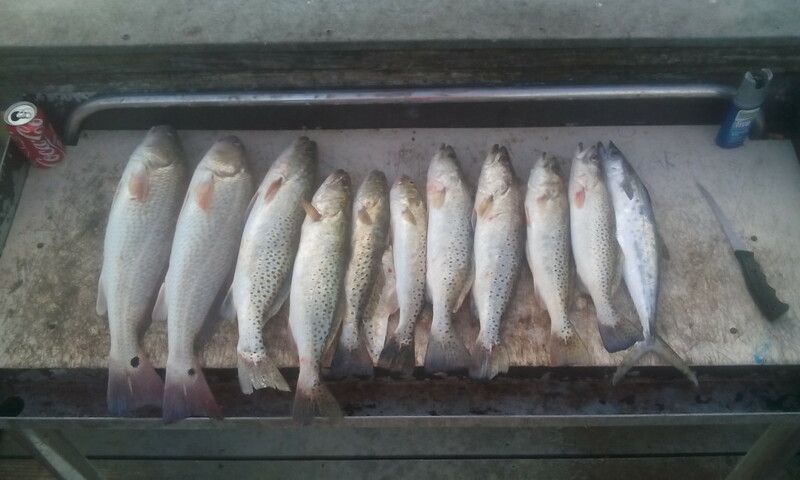 They caught some nice Trout, along with some Redfish. 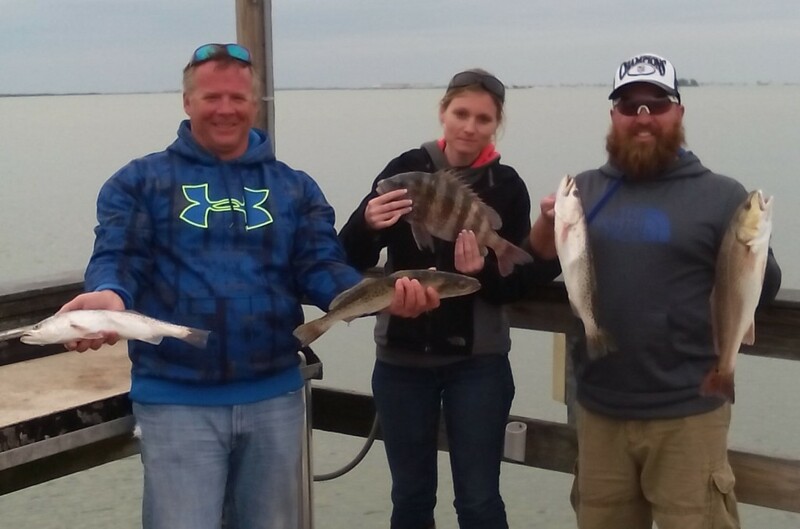 Sheepshead and black drum have still been around and have also been willing to bite even though the temperatures are down. Most of the sheepshead have left the inshore docks and pushed out to the near shore reefs and rock piles in 12-20′. Live shrimp or fiddler crabs fished on a light jig head or a knocker rig have been producing good results. Black drum have still been around the inshore docks and oysters, and have have been common catches when targeting redfish. Most of these drum have been smaller fish in the mid 20” range. The large black drum over 30lbs should be showing up here in the coming weeks. Hopefully this will be the last of the major cold front for the year, as Spring is just around the corner and Kingfish and Mackerel season should be here in no time! So while the weather isn’t the best take time to get your gear ready and your trips booked. February fishing has had it’s ups and down’s with the few cold fronts that have hit our area lately, but the Trout and Redfish haven’t seemed to mind to much! 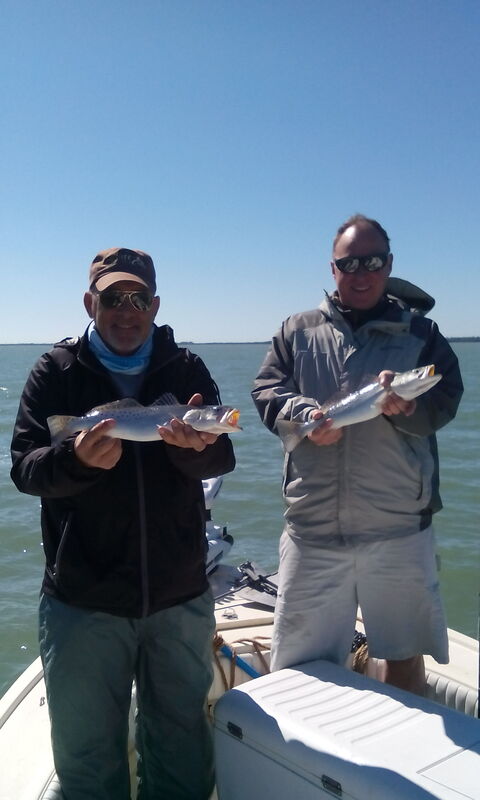 Trout fishing has been outstanding over the past few weeks, and Redfish bite has remained steady and slowly improving. Sheepshead and black drum are still being caught, but weren’t as frequent as they were last month. 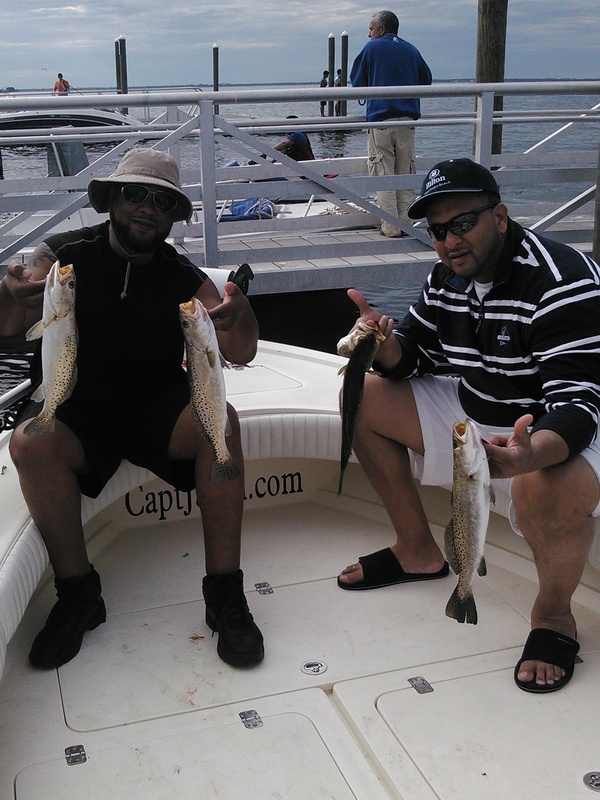 Trout fishing has been awesome with a lot of quality fish being caught on recent charters. 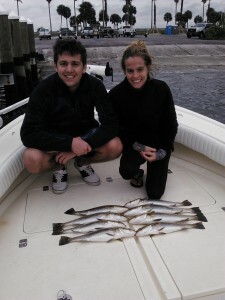 Limits of trout have came on every charter this past week while fishing in the Tampa Bay area. Most of the fish have been slot size with a few over the 20” mark. A lot of these bigger fish over 20” are females that are important to the breeding population, and I personally try to release these fish, unless they are gut hooked. Live shrimp fished under a cork has been been producing good results, but artificial’s have been working just as well. Soft plastic jerk baits in darker colors fished on the bottom have been top producers, but suspending twitch bait’s have produced some of the larger fish. Look for the trout fishing to remain consistent for the rest of the month. Redfish have been getting bigger, and more abundant as the month progresses. In the past few days I have been seeing some larger fish showing up. There still has been plenty of “Rat” red’s around lately, with a few slot size fish mixed in. Look for the Redfish to be hanging around docks, oyster bars, and mullet schools right now. Jumbo shrimp free lined in these area’s have been the go-to baits. Scented soft plastic shrimp have also been work well lately, as well as gold spoons. Schools of bigger Redfish should be showing in no time, and most of the fish should be upper to over slot size. I expect this to happen towards the end of the month as we get closer to new moon and Spring! The last week of January started out with cold fronts moving in and temperatures dropping rapidly. This has made fishing a little bit more difficult, as it is harder to build a pattern. A lot of the fish I have been on have been moving on a daily bases, and the bait has been harder to obtain. Before for the fronts came in the Snook fishing remained good, with trout fishing being steady, and red fishing getting better each day. 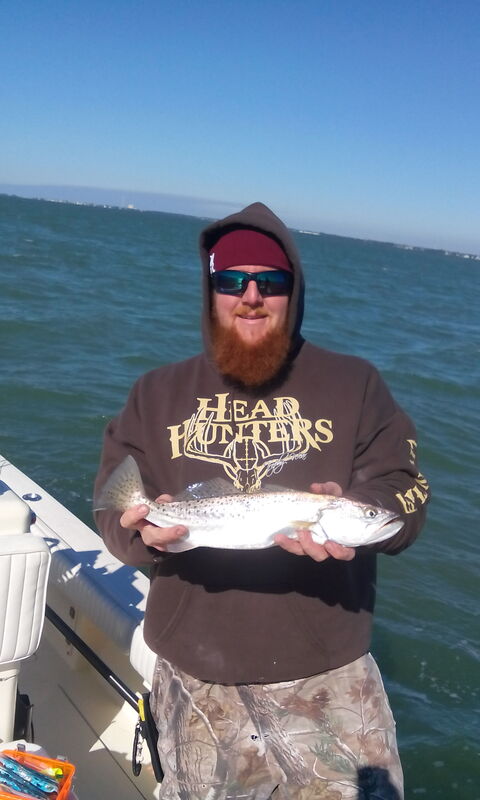 Trout fishing has remained steady for the past couple weeks, and limits of trout are being caught on every fishing charter in both the Tampa bay and Clearwater area. Live shrimp has been producing good results either free-lined or fished under a cork. Soft plastic jigs have also been producing just as well as live bait. Darker colored soft plastic jerk baits fished on a lighter jig heads such as a 1/16 or 1/8oz. jig head have been the out producing many other artificial’s. Most trout have been between 16-18” with a fair number of fish that have been in the mid 20” range. 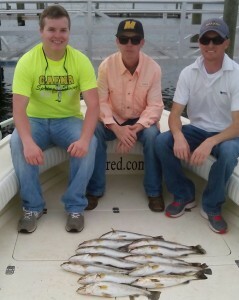 Clint, Chase, and Trey with a limit of trout they caught on a half day fishing charter in Tampa bay, FL. Red fishing in the Tampabay area has been getting better and better each day. Most of the fish have still been lower slot size in the area’s I have been fishing, but the larger fish are starting to push back in from the reports I am getting from other captains fishing in the south end of the bay. There has been plenty of large fish up shallow on the sand flats in the upper area of bay, and fly anglers and guys willing to sight fish have been getting plenty of shots at these fish. Live shrimp fished on a 1/0 circle hook with a split shot has been the bait of choice as of lately. Robert and Carroll with a Redfish and Black Drum caught while on a fishing charter in Clearwater, Fl. Sheepshead and black drum has also been making a appearance quite a bit lately, especially fishing around docks. Live shrimp fished on a 1/0 circle hook with a split shot have been the go to rig. A lot of the sheepshead are keeper fish, and the black drum have been mid 20” range which make for good eating size. January started off with good snook fishing, but the snook bite has slow way down, and is almost non-existent, but for the lack of snook the trout and redfish had made a big showing! Limits of trout and redfish are occurring during almost every fishing charter in Tampa bay or in the Clearwater area. Some days have been tougher than others, but that’s fishing. Shrimp and jig have been the main baits of choice over the past ten days while… fishing in Tampabay, and I expect this to remain the same till we start having some warmer weather. Trout fishing has been excellent, and maybe even the best I have seen in the past 5 years. The trout we have been catch have been big, fat, healthy fish, with most of them being upper slot around 18” although we have had many trout in the mid 20” range. I personally don’t like to keep trout bigger than 20” as they are the larger females which are important for the future. I also try and avoid touching any trout that I don’t plan on keeping. The trout bite has been steady with both darker colored soft plastic jigs and live shrimp fished on the incoming tides later in the afternoon. Look for the trout to be over spotted grass flats in5-7’ of water. Deep canals and creeks are also holding a lot of smaller trout as well. 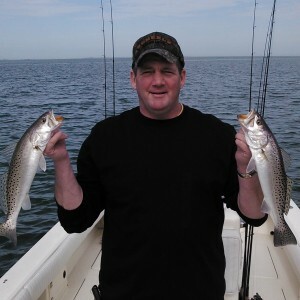 Dan with a double header he caught while on a recent fishing charter! Rob with a nice Trout he caught on fly while on a Tampa Fishing charter. 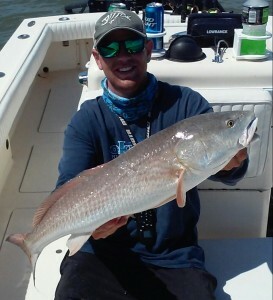 The Redfish bite over the past week approaching the new moon has been excellent with a lot of redfish being caught during most charters when we aren’t even targeting them. Live shrimp with a small split shot or a light jig head has been the rig and bait of choice for the reds as of lately, but we have caught a few throwing scented soft plastic’s around oyster bars, docks and mullet schools. Most the fish being caught lately have been under slot to mid slot size fish, but there is plenty of them around as of lately. I have also been getting good reports for my fly fishing guide buddies saying they are getting plenty of shots at upper and over slot size fish if you are looking to catch one on fly rod. 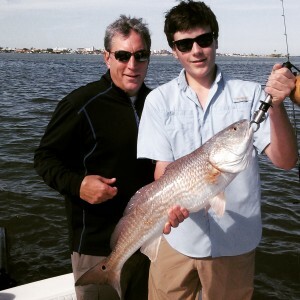 Connor and Rick with a nice Clearwater red fish caught on a inshore fishing charter. Red Fishing Charters are starting to heat up! If you are looking book a Fishing Charter in Tampa, Clearwater, St. Pete, Tarpon Springs, or Dunedin call 727-831-0111 or email Simonetti_jared@yahoo.com. I also have a lot of requlars clients down this time of year that are always looking to split the cost of a charter, so If you are interested in splitting a charter please email me, and I will see if I have another angler looking to do the same. The first week of 2015 has begun, and the inshore fishing has been outstanding! Snook fishing this winter has been phenomenal and the trout fishing is no exception! Over the past week I have been running charters every day, and most trips have been producing outstanding catches with most days producing 60-80 fish days on four hour trips with some trips pushing a 100 fish! 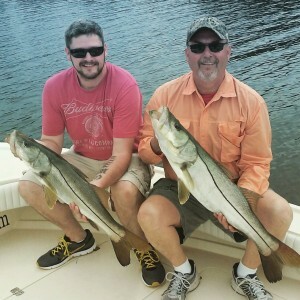 Snook fishing this winter, and this week in Tampa bay has been outstanding with most charters catching dozens of snook with a few real nice fish mixed in. Most of the snook have been on the smaller side ranging between 16-28”, but we have been getting a few on the larger size in the mid 30” range. White bait and shrimp free-lined on both tidal phases has been producing good results. Trout fishing has been really good this week with limits coming quickly. Most of the trout we have been catching have been mid slot size fish, with some really nice trout pushing the 20” mark being caught. Soft plastic jigs and mirro-lure mirrodine’s have also been working well. The morning trout bite has been slightly better than the afternoon bite on most days this past week. Tips- Morning trout bite and afternoon snook bite. Happy Holidays! The inshore fishing over the past week has been steady with plenty of trout and snook action to keep most of anglers catching their entire trip. 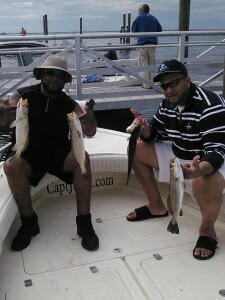 This week I ran a few half day charters and we caught 75+ fish on each half day fishing charter. The back country snook and trout bite has been the most consistent, and we have even been getting a few redfish in the mix. Snook fishing continues to be outstanding lately with the warmer winter we have been having. White bait has still been around and is well worth getting, some days it has been easy other days I have been spending a couple hours to locate it and catch enough to fish with. Having plenty of white bait in order to chum has made the difference of having just a decent day and having a really outstanding day. Most of the snook we have been catching have been on the smaller side ranging anywhere from 18”-28”. We have hooked a few that have been much larger, but they have taken us to school every time. Trout fishing remains steady with plenty of slot- size fish around. A lot of the trout we have been catching out around the spoil island’s and rocky out cropping’s have been lower to under slot size fish, but there has been plenty of nice slot-size fish mixed in. 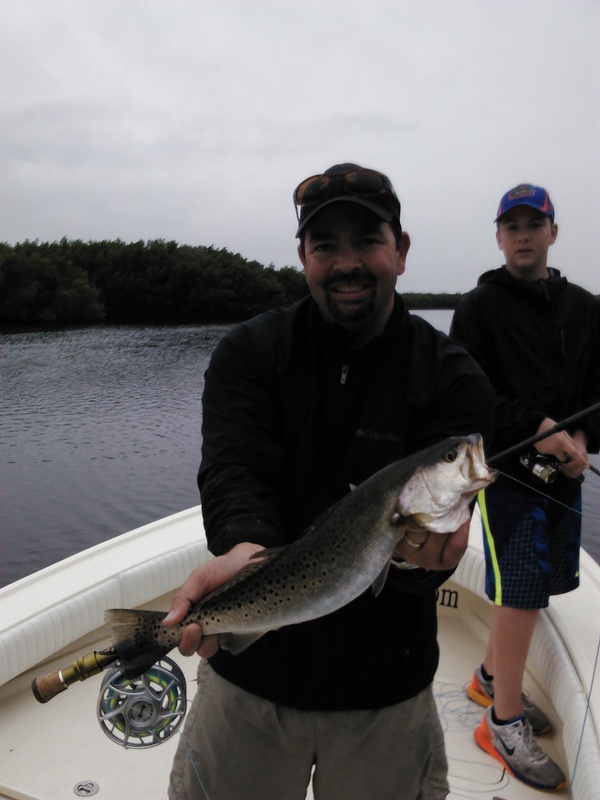 While fishing in the back county for snook we have been catching quite a few trout, and these fish have been much larger and most are the same size as the snook we have been catching. Eric and Dennis with some Dinner Trout! Tackle- Light spinning rod, 10-20lb braid, 15-20lb leader, 1-1/0 circle or j-hooks. December has started out with excellent weather unlike the previous month of November, which was almost a complete blow out with front after front and 20mph winds. The inshore fishing this past week was phenomenal with slams coming to the boat almost every trip. Although the Trout and Redfish action has been awesome! Trout fishing has finally started to pick up in the last week with the slot fish starting to school up, and the larger breeder trout starting moving into the shallows. Look for slot size fish to be in the deeper channels and creeks throughout the bay area. Live shrimp, sardines, and jigs have been producing limits on daily basis. The larger breeder size trout have also started to show up in their shallow winter time haunts. These big trout can be extremely spooking and require a long cast in order not to spook them. Darker colored soft plastic jerk baits rigged weed less or on a light jig have been producing the best results, although large live shrimp free-lined are hard for these fish to pass up. The redfish fish bite has been outstanding this past week as well with good numbers of fish being caught on every trip as well, most of the fish have been under slot to mid slot size. Look for the redfish to be hanging out around docks and oyster bars this time of year. Live shrimp and soft plastic jigs have been working equally as well. Snook have still been around and I have been finding them on the open flats, around docks, and in the back country. The fish have been a little sluggish, and fishing late in the afternoon has produced good results once the water has warmed up. Live sardines and shrimp have both been working well, but artificial lures have been out producing bait. Soft plastic jerk baits fished on 1/4oz. jig heads fished slow and on the bottom have been my go-to baits. Pompano, Cobia, Jacks, and Sharks have also been around the warm water discharge of the power plants. This fishing around these areas has been sporadic at best, but worth taking a look if you are in the area. Look for these areas to heat up in the coming weeks with the arrival of the winter time cold fronts.